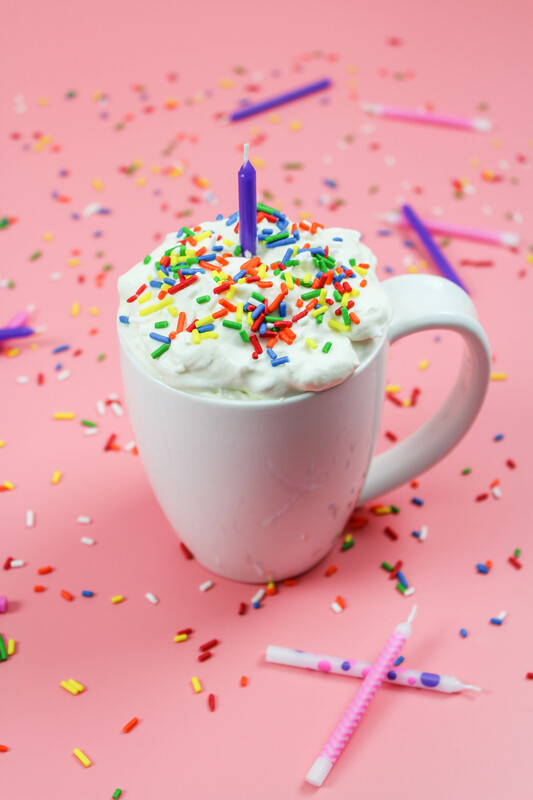 This birthday cake hot chocolate is easy to make, delicious, and there are sprinkles involved. 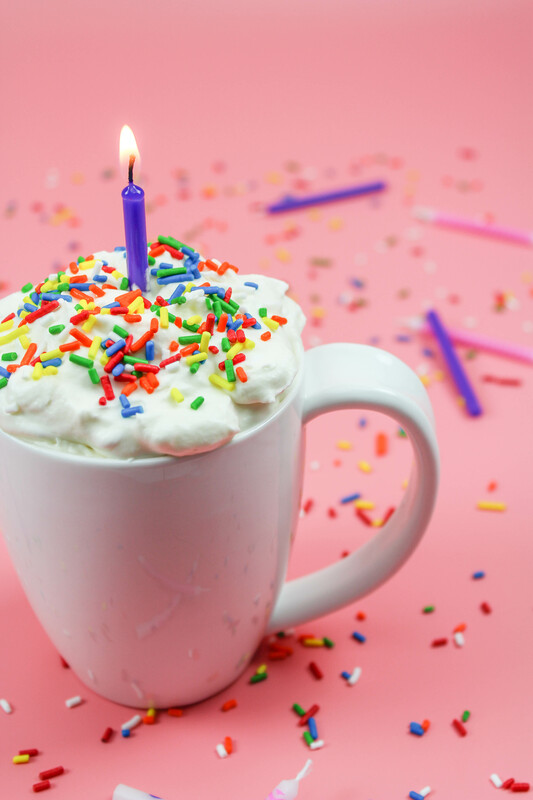 Find out how to make your own batch for an upcoming birthday! March is one of my favorite months. I may be a little bit biased, since my birthday takes place in March, but to me it signifies a fresh start. Spring is starting to peek it’s little head out of the snow filled clouds, bulbs are starting to shoot up out of the ground, and yes, I turn another year older wiser. As I get older, I dread some things, but I’ve actually learned to appreciate each and every new year that hits me. And so far, the 30’s have been the best yet. (I might change my tune when I hit 40. I’ll keep you guys posted). 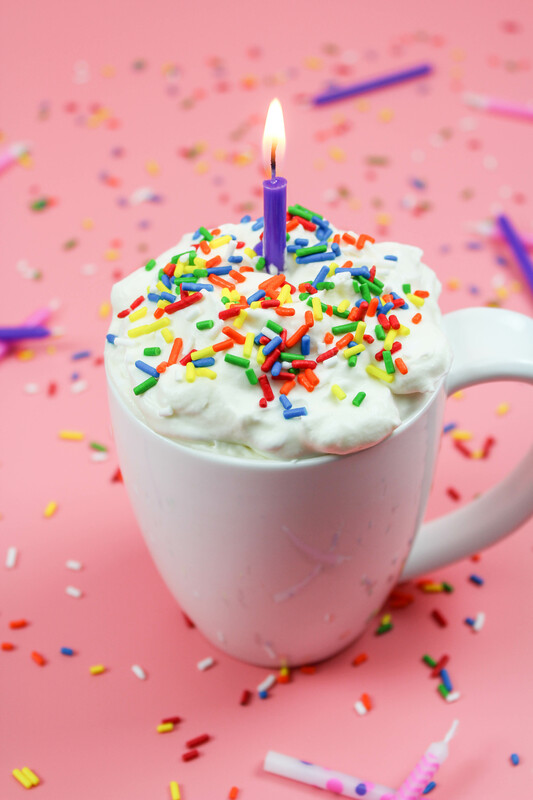 This year, I was lucky enough to celebrate surrounded by friends, but there is one thing that I can think of that would have made my birthday that much better…Birthday cake hot chocolate! Yep, you read right. Birthday. Cake. Hot. Chocolate. And, yes, I promise it tastes just as delicious as it sounds. I taste-tested it for you. Multiple times. It’s creamy, white chocolaty, and even has a buttery-cakey flavor too. (Made a few words up just then…go with it). 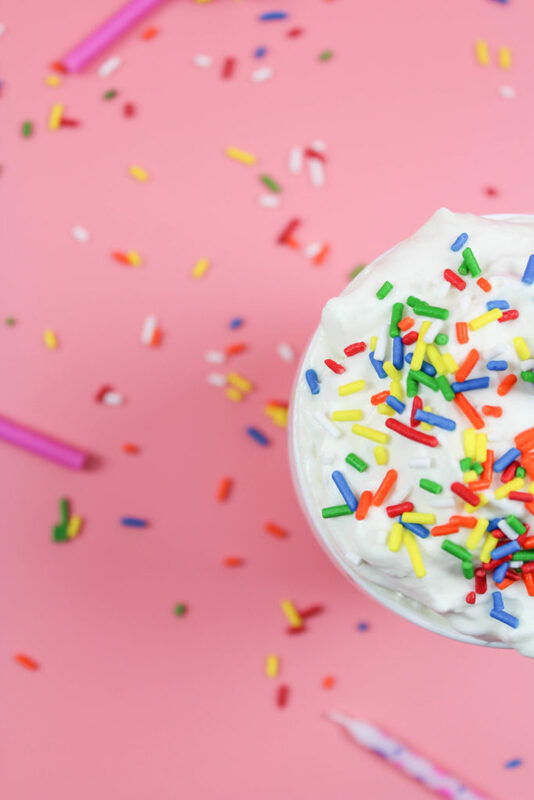 Plus, it’s topped with marshmallow whipped cream and sprinkles, which you can never have enough of, in my opinion. Bring the milk to a simmer in a medium sized pot over medium-low heat. Whisk in the dry cake mix until it is fully dissolved. Add the white chocolate and whisk until completely melted. In a stand mixer or using a hand mixer, beat the heavy whipping cream on high speed. Continue beating until soft peaks have formed. Add in the marshmallow cream and the remaining teaspoon of vanilla and continue to whip on high speed, until well blended and a stiffer peak has formed. 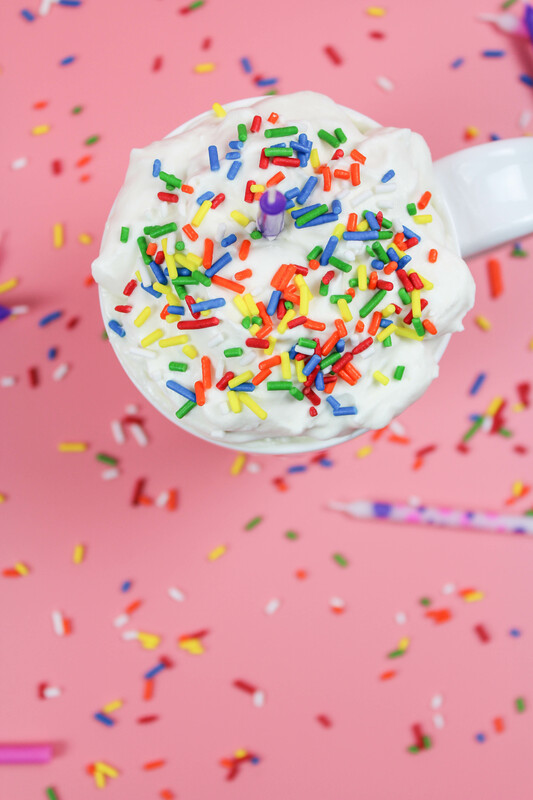 Pour the hot chocolate into mugs and top with the marshmallow whipped cream. Add some sprinkles on top (the more the better!) for a festive touch! The recipe is easy to make and, let’s be honest, doesn’t homemade hot chocolate just sound so much more impressive? 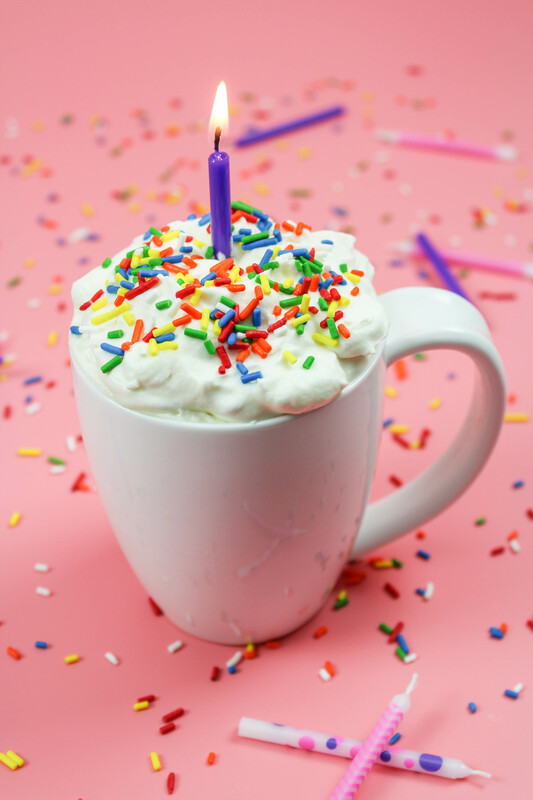 I love the idea of this birthday cake hot chocolate being served as an annual birthday tradition too! I don’t think any kid (or adult) would turn this down!